UPDATE: The Andaz Singapore chatbot project was so successful, that it won Hyatt International’s prestigious CEO’s Award for Innovation! Read on to find out more about it! Andaz Singapore is a hotel under the Hyatt International group that is situated near Marina Bay and at the crossroads of the Kampong Glam, Little India and Bras Basah Bugis cultural districts. The Andaz Singapore team is laser-focused on providing its guests with a casual yet memorable experience, and are doing a brilliant job of achieving this under General Manager Olivier Lenoir. No other hotel oozes as much style and class as Andaz, with staff clothing partnerships with brands like In Good Company, and the many world-famous art pieces thoughtfully placed around the premises. Andaz aims to spark off a sense of discovery of the rich culture of Singapore, and inspire guests to experience the city through fresh perspectives. Vouch helps them fulfil this aim. Using a virtual concierge built in collaboration with Vouch, Andaz has found a way to be responsive to guest queries, while cutting down the amount of time its call centre and front desk spend answering common questions. 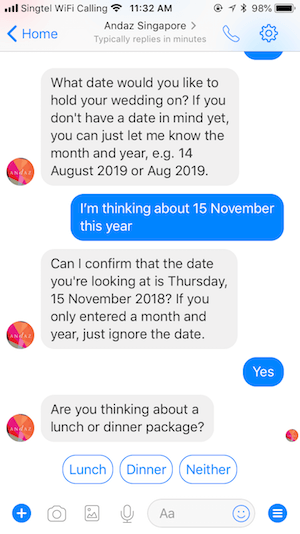 More importantly, Andaz is able to provide an innovative experience to guests, enabling them to take a guided tour hosted by one of two different, interesting chatbot personalities lovingly crafted by the team. Andy and Ann Li, Andaz’ virtual tour guides, can help answer guest questions about anything ranging from early check-in to airport transfer, as well as take them on tour around the hotel as well as the culturally rich Bugis neighbourhood, giving guests a unique, engaging, and fun experience. 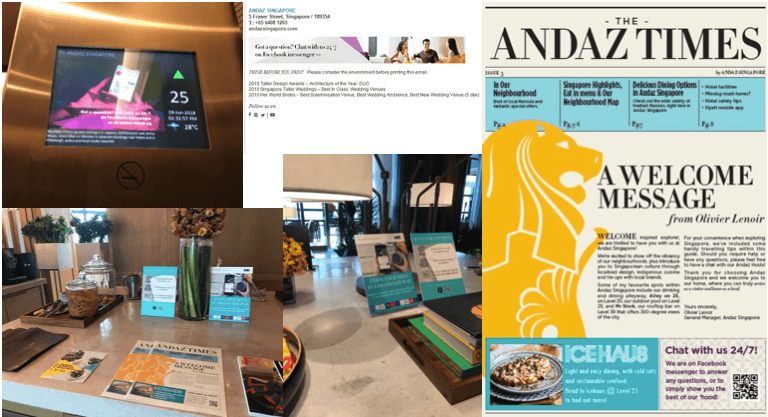 Working with the Andaz team was a delight (thank you Olivier and team) – they were enthusiastic about working with us and had many great ideas on how they wanted Andy and Ann Li to sound and what the bots could do. With our expertise and their branding guidance, we created the framework and bot flows for the virtual concierges. How intelligent a chatbot is depends a lot on the amount of data it is trained on. To that end, its important to have as many people talk to the bot as possible in order to train and update its Artificial Intelligence (A.I.). If we could get almost every single guest to use the bot, we knew we’d have a smart chatbot that could help reduce the workload on the concierge as well as give guests a really cool experience. To achieve this, the Andaz team worked with us to create collaterals that we placed in key locations. When guests first make their way up to the hotel in the lift, at the reception, in the lounge, in the newsletter in every guest’s room… Even in the emails that Andaz team sends out! Finally, we helped add the chatbot to Andaz’ Wifi landing page, ensuring that every guest that connected to Wifi (isn’t that everybody?) would get the chance to experience Andy/Ann Li. 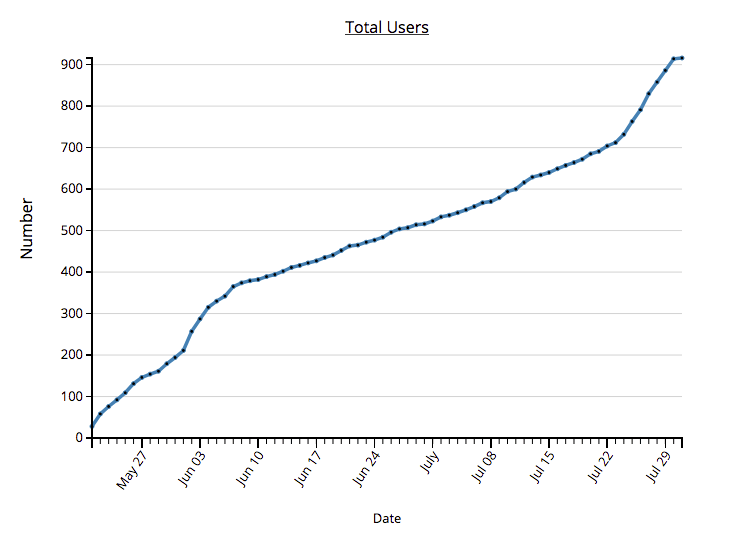 The Andaz Singapore chatbot has seen rapid growth, with more than 2100 peopleengaging with the bot and north of 31,000 messages processed in under 3.5 months, and these numbers are now growing at around 20% week-on-week. Andy now helps Andaz answer more than 90% of queries received, and can even tackle seasonal questions like "Can I see the NDP fireworks from my room?". Time spent on guest calls received by the back-room staff have dropped by up to 31%. Andy also helps with lead generation, providing instant answers and gathering essential information from people searching for wedding or meeting packages, then handing these leads over to the appropriate team to follow up. In the past 3 months, Andy has generated more than 35 leads for the team, saving time and capturing business for Andaz. If you’re still on the fence about how A.I. 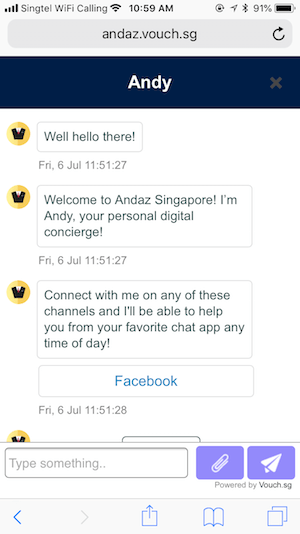 and our chatbots can help your hotel, we’d just like to share this screenshot of our chat with the Andaz team. Interested to get in touch with our team? 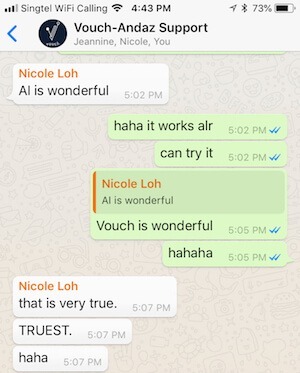 Just talk to our chatbot or drop us an email at general@vouch.sg and we’ll set you up with your own sweet, sweet digital concierge. Or try out a demo of Andaz’ one here! PreviousIs it time to get a Chatbot?